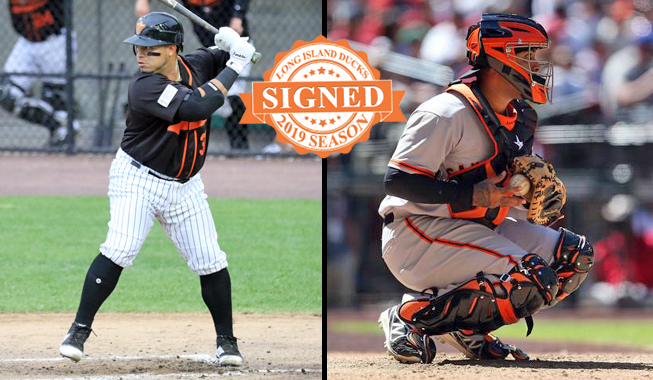 (Central Islip, N.Y., April 8, 2019) – The Long Island Ducks today announced the signing of catchers Ramon Cabrera and Hector Sanchez. Cabrera returns for his second season with the Ducks and 12th in professional baseball, while Sanchez begins his first season on Long Island and 13th in professional baseball. Cabrera joined the Ducks in May of 2018 and went on to play 84 games with the Flock. He compiled a .268 batting average with three home runs, 31 RBIs, 27 runs, 84 hits and 21 doubles, which was tied for second-most on the team (Lew Ford, 33). The Venezuela native was selected to play in the Atlantic League All-Star Game, held at Long Island’s Bethpage Ballpark, and started the game behind the plate. During the postseason, Cabrera posted a .378 batting average, the highest among Ducks players who appeared during the entire postseason, and added an RBI, two runs, three doubles and two walks. Prior to joining Long Island, the 29-year-old reached the Major Leagues with the Cincinnati Reds in 2015 and 2016. He combined to play 74 MLB games, hitting .264 with four homers, 26 RBI, 15 runs, 53 hits and 11 doubles. Defensively, he posted a .990 fielding percentage behind the plate and threw out 25% of base runners trying to steal. The backstop was twice named an MiLB.com Organization All-Star (Reds, 2015 and Pirates, 2011) and was also named a Topps Class A All-Star in 2011 after hitting .343 with the High-A Bradenton Marauders. In addition, he is a four-time Mid-Season All-Star selection, collecting the honor in 2010 (South Atlantic League), 2011 (Florida State League), 2012 (Eastern League) and 2014 (Eastern League). Cabrera was originally signed by the Pirates as an amateur free agent in 2008. Sanchez brings seven seasons of Major League experience to the Ducks, having spent time with the San Francisco Giants (2011-15), Chicago White Sox (2016) and San Diego Padres (2016-17). In 347 MLB games, he accrued a .238 batting average with 21 home runs, 120 RBIs, 60 runs, 186 hits and 38 doubles. Defensively, he turned in a .988 fielding percentage at catcher and threw out 25% of base runners attempting to steal. The 29-year-old’s career was highlighted by helping the Giants win the 2012 World Series in a four-game sweep over the Detroit Tigers.